The mid-century inspired Ulm Dresser features classic shaped pulls and overall design simplicity with straight forward lines resting atop solid birch turned and tapered legs. Made from beautiful and sustainably harvested birch plywood and green grade MDF made from 100% recycled/ reclaimed wood. The Ulm Dresser offers three large drawers with self closing/soft close drawer slides. Includes safety strap that is mounted to wall, for extra safety and stability. Sustainably made in Europe in an FSC Certified factory. Available changing tray fits on top and securely fastens in from back side keeping hardware hidden (sold separately). The legs and drawer fronts are packaged separately for light assembly at the time of set up in the home. 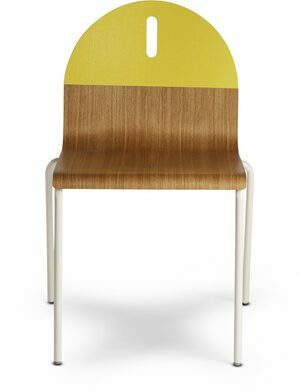 Made from sustainably harvested birch plywood and green grade MDF made from 100% recycled content. Design Public is an authorized USA dealer for all Spot on Square products.